1st FEB1961 Recorded DeliveryEnvelope addressed to Leeds and sent on the FIRST DAY OF RECORDED DELIVERY together with its Certificate of Posting. 1843 "Registered Letter" FROM MARGATE addressed to Saxmundham via London. MS 1/1 in Red. Attractive. 1895 I.R. 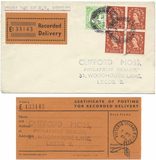 OFFICIAL 1d Lilacs x 3, SG O3, tied to registered envelope to Watford by REGISTERED/NORTHAMPTON oval datestamps, showing a VERY FINE FRAMED "REGD/2D" OF NORTHAMPTON. RARE. 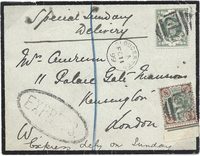 1856 Plain Registered envelope addressed to Bakewell and franked by an EMBOSSED 6d MAUVE, SG 58 and a 1d RED-BROWN, SG 29, tied by very fine CAMBRIDGE '158' numeral cancellations. Holcombe Certificate. VERY ATTRACTIVE. 1901 Registered envelope to France and redirected, franked by a 4½d Green & Carmine, SG 206, 1d Lilac, SG 172 x 4 and ½d Blue-Green, SG 213 x 2, all tied by REGISTERED/COLCHESTER oval datestamps - A COLOURFUL MULTIPLE FRANKING! 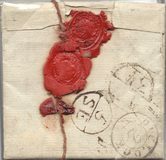 1874 REGISTERED ENVELOPE addressed to Pudsey franked by a 1d Rose-Red, SG 43, Plate 165 and a 4d Dull Vermilion, SG 93, Plate 13, and tied by Manchester '498' numerals. 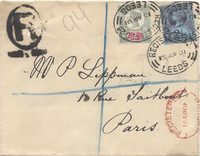 1886 2½d Lilac, SG 190, tied to 2d Registered Stationery Envelope to Switzerland by a very fine MANCHESTER '498' NUMERAL IN BLUE. 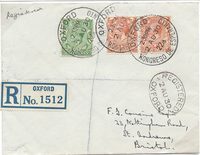 1857 REGISTERED ENVELOPE franked by a 6d Lilac, SG 70 and 1d Rose-Red, SG 40, tied by London '75' numerals, addressed to Exeter and showing a very fine oval REGISTERED/DATE/G.P.O. in Red. 1871 Registered cover from Chemnitz to London showing a fine OVAL-FRAMED REGISTERED-LONDON/DATE/FROM/PRUSSIA IN RED. Attractive. 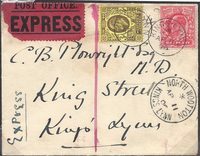 1885 2d Registered Stationery envelope from Stockport franked by a 1d Lilac, SG 172, and cancelled by a '733' duplex; there is also a small 'MAPLE.BRIDGE' cds. 1937 Cowal Highland Games "Mobile Post Office" Registered envelope to Glasgow. 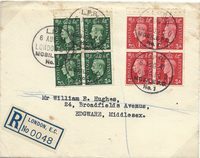 1938 George VI ½d to 2d, SG 462A-465A with SIDEWAYS WATERMARK - Superb used set up to the 2d (less 2½d) tied to Registered envelope to Sutton Coldfield by very fine EXHIBITION P.O. GLASGOW cds. 1942 Registered envelope from OSE DUNVEGAN/ISLE OF SKYE to Aberdeen, cancelled by OSE DUNVEGAN/ISLE OF SKY cds and with OSE Registered Label. 1849 Registered envelope from PORTREE/ISLE OF SKYE to Aberdeen cancelled by a 'Portree/Isle of Skye' cds and with a Portree Registered label. 1949 Registered Envelope from STORNOWAY/ISLE OF LEWIS to Aberdeen, cancelled by 'Stornoway/Isle of Lewis' cds together with a Stornoway Registered label. 1901 Parcel Post label, WIMBLEDON, B.O., WANDSWORTH, cancelled by a "Registered 2d" handstamp. 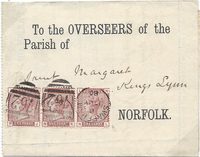 1880 1d Venetian Red, SG 166, strip of Three tied to Lynn 'NOTICE OF OBJECTION' FORM, tied by Swaffham duplex. Sent at the special Registered 3d rate for forms concerning Voting Rights and Objections to such applications. Attractive. 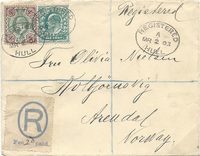 1895 2d Blue REGISTERED envelope to Austria franked by a 4½d Green & Carmine, SG 206 and ½d Vermilion, SG 197, tied by 'STRAND 369 BO/WC' circular datestamps - 7d Double Rate. 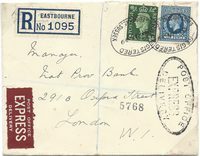 1907 Registered envelope from Denmark to London showing on the reverse a very fine REGISTERED/LONDON-&-QUEENBOROUGH/S.T. Hooded Circle, W 510, 24 mm circle. 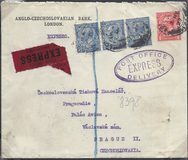 1927 POST OFFICE/EXPRESS/DELIVERY from London to Czechoslovakia - POSTAGE 2½d, Express Fee 6d. 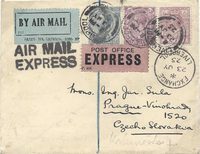 1925 AIR MAIL EXPRESS envelope to Czechoslovakia from Liverpool, a re-use in 1925 of the cachet used on the first London/Paris airmails 1919-20. Very Scarce. 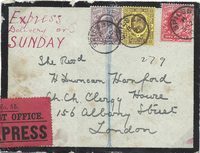 1920 Single-weight Express letter from Charing Cross to Paris by AIR MAIL/EXPRESS franked by Edward VII ½d, 1d, 3d, 5d, 6d, 7d and 10d, total 2/8½d = 2/- Airmail Fee, 2½d Postage and 6d Express Fee. Attractive and Scarce. 1878 2d Blue Registered envelope to Penryn franked by a 1d Rose-Red, SG 43, Plate 197, tied by a very fine BIRMINGHAM '75' NUMERAL IN BLUE. A few tone spots, otherwise fine.